As a country, we grapple with more than our share of discrimination challenges--where people of color, LGBTQ folks, and people with disabilities (to call out only a few of the bigger groups) feel its blow every single day. And while it's frustrating at best, and often devastating, at least there's a dialogue about it, and at least you can find outrage if you're looking for it. In book publishing, however, there's a sanctioned discrimination against authors who subsidize their own work, and if people even bother to acknowledge it, few seem to be outraged. It's upsetting because publishing folks are generally pretty liberal people--not the kind to condone discrimination in any form. Discrimination, however, is at its worst and most insidious when it's sanctioned--and exacerbated when the perpetrators are justifying it as okay, business as usual, and just the way things are. In a recent Guardian post, Ben Galley traces the rise of the self-publishing stigma--noting that it stemmed from a flood of substandard books entering the marketplace. "Bad editing, awful covers, and mediocre content were rife," he writes. In his post, which asserts that the stigma is fading, Galley concludes that it's "short-sighted to ignore the indie author." I agree with him, but I want to take this a step further and suggest that indie authors begin to demand a more level playing field. Books that are poorly edited, have awful covers, and that suffer from mediocre content may still abound, but they are not difficult to spot. I can spent five minutes (oftentimes less) with a book and assess its merit. I have my training as a former executive editor to thank for this skill, yes, but anyone with a trained eye can sort out the rubbish from the books of merit. As of today, the industry still only sees books as either-or, self-published or not, even though indie authors have moved on from this model and many are occupying the gray zone in between. And yet instead of coming up with a list of quality measures for books generally--like a catchy opening few pages, a fabulous cover, a book that meets the standards of a traditionally published book--the industry has instead chosen the lazy (and yes, discriminatory) path of measuring a book's worth by whether or not the author has paid to publish. Here's how this actually plays out. In the world of reviews, industry magazines have created separate self-published sections, for which self-published authors pay to get reviewed. Their traditionally published counterparts do not pay, and industry people (book buyers, librarians, decision makers) are not blind to the fact that these self-published review sections are under a different heading--like Publishers Weekly's "Select" and Kirkus's "Indie Reviews." A review from one of these sections brands authors as self-published, and the industry is invested in keeping it that way. Now let's move on to the world of contests, which are worse offenders because many of them simply bar self-published authors from entering. The rules won't always blatantly discriminate, in that most of them won't explicitly state "no self-published authors" (though some do). Instead they prohibit any author whose books are print on demand, or whose work is "subsidized," or who did not receive an advance. Subtle, right? And then there are the associations, like the Mystery Writers of America and countless others, that do not allow self-published authors into their ranks at all. These are organizations that claim to support authors to succeed, and yet what they're really doing is erecting barriers to keep some authors out. This smacks of schoolyard ostracizing. If traditional publishing were holding up a high standard with every book published, I might tone down my firm accusations of wrongdoing here, but instead they're publishing so many books whose literary merit is questionable at best. And on the same note, there are self-published authors who are striking out on their own, green-lighting their work, and becoming bestsellers, sometimes selling their work to traditional houses, sometimes not. The indie author community has been striving to raise its own standards, and while it's being noticed, the industry is making no moves to shift their segregated practices. I implore all you indie authors: Stand up to this discrimination when and where you encounter it. Authors who've paid their way should not lie down and take it just because the discriminatory rules reaffirm some sense of not having "made it." Organizations like the Independent Book Publishers Association are already taking strides in their author advocacy for all authors to bring issues like these to the forefront, but the only way to level the playing field and to eradicate discrimination in publishing circles is to name it when you see it. Write the review outlets, contests, and associations letters. Include your endorsements, awards you may have won, and any other accolades. The only way to change this industry is to force the insiders who are setting these rules to see that what matters is not whether an author pays for their work to be published. What matters is the work itself, and that stands on its own, regardless of the author's path to publishing. 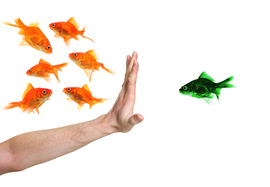 Have you encountered discriminatory practices? Been barred from entering contests or from membership in associations? If so I want to hear your story for a bigger op-ed I'm working on--and thank you!